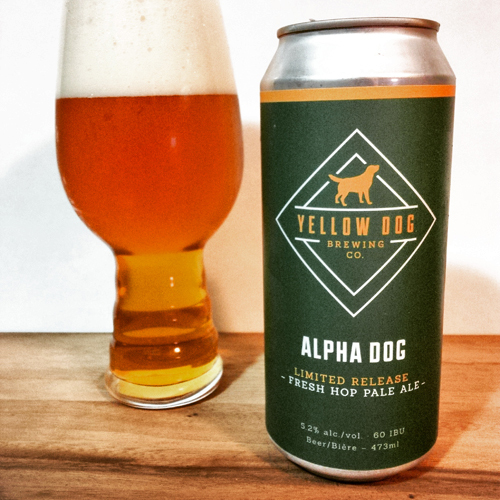 Yellow Dog Brewing Alpha Dog Fresh Hop Pale Ale: Brewed with fresh Citra hops from Yakima, WA this Pale Ale comes in at a strength of 5.2% abv and 60 IBUs. What’s interesting about this beer is that it is made from fresh hops outside of BC in one of the most famous hop growing regions in the United States. Personally I’ve always found that the hops grown in this region tend to make the best fresh hop beers, so I knew I was in for a tasty treat! Aroma and Appearance: It pours a clear golden amber colour with three fingers of fluffy white foam and just a hint of carbonation. The aroma is fresh passion fruit, lemon leaves, newly cut grass, mango and a smattering of honey. Flavour: There is a huge oily hop presence up front, featuring lemon leaves, lemon citrus and some light bready malts. In the middle there are some green tea leaves present for a while, eventually leading into a big grassy finish that’s dry and slightly resinous with notes of floral pine needles on the aftertaste. Overall Impression: Very nicely done, overwhelmingly fresh and very pleasant on the palate. Rating: I give it an excellent rating of 8/10, a nice example of fresh Citra hops that brings out some subtle lemon leaves and grassy notes normally not present in the pelleted version. Food Pairing: Some light crackers and plain goat cheese would work well here, stay away from anything overly pungent as it will overpower the subtle hop notes in the beer. Ever wonder how hops are harvested on a big farm? Check out this snippet below from YCHHops that they posted on their Instagram account (don’t forget to follow them!). This is the place that supplied Yellow Dog the fresh Citra hops that they used in Alpha Dog!